Tugboats approached the fully launched Frank Cable (AS-40) to remove launching gear and move it to the vessel's outfitting pier in Elliot Bay. 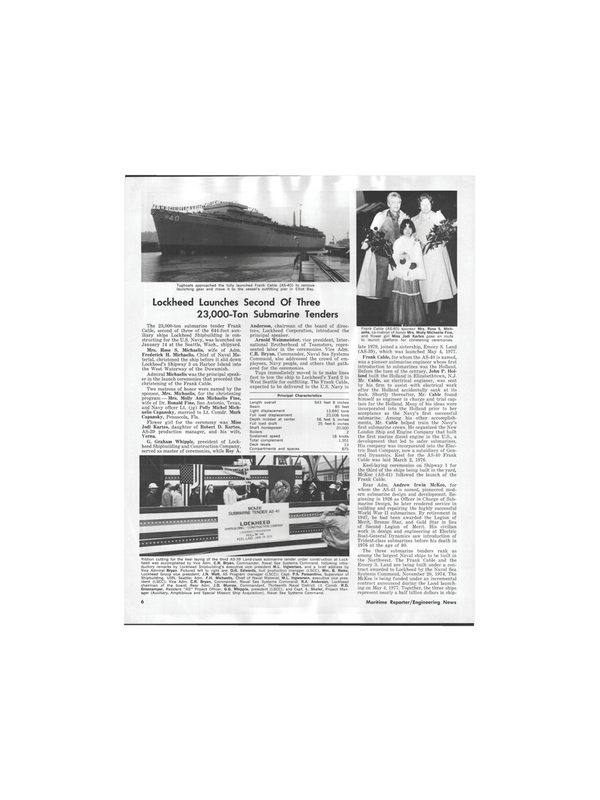 Lockheed Launches Second Of Three 23,000-Ton Submarine Tenders late 1979, joined a sistership, Emory S. Land (AS-39), which was launched May 4, 1977. Frank Cable, for whom the AS-40 is named, was a pioneer submarine engineer whose first introduction to submarines was the Holland. Before the turn of the century, John P. Hol- land built the Holland in Elizabethtown, N.J.
London Ship and Engine Company that built the first marine diesel engine in the U.S., a development that led to safer submarines. Cable was laid March 2, 1976. Trident-class submarines before his death in 1976 at the age of 80. Shipbuilding, USN, Seattle; Adm. F.H. Michaelis, Chief of Naval Material; M.L. Ingwersen, executive vice pres- ident (LSCC); Vice Adm. C.R. Bryan, Commander, Naval Sea Systems Command; R.A. Anderson, Lockheed chairman of the board; Rear Adm. J.D. Murray, Commandant, Thirteenth Naval District; Lt. Comdr. R.D. Greenamyer, Resident "AS" Project Officer; G.G. Whipple, president (LSCC), and Capt. L. Shafer, Project Man- ager (Auxiliary, Amphibious and Special Mission Ship Acquisition), Naval Sea Systems Command. January 14 at the Seattle, Wash., shipyard. Mrs. Rose S. Michaelis, wife of Adm.
Lockheed's Shipway 3 on Harbor Island into the West Waterway of the Duwamish. Admiral Michaelis was the principal speak- er in the launch ceremonies that preceded the christening of the Frank Cable. G. Graham Whipple, president of Lock- heed Shipbuilding and Construction Company, served as master of ceremonies, while Roy A.
Anderson, chairman of the board of direc- tors, Lockheed Corporation, introduced the principal speaker. Arnold Weinmeister, vice president, Inter- national Brotherhood of Teamsters, repre- sented labor in the ceremonies. Vice Adm.
Command, also addressed the crowd of em- ployees, Navy people, and others that gath- ered for the ceremonies.